← How to organize PDF page in batch without opening PDF files? This article would like to introduce you a convenient way to recover pdf password for Mac OS X with PDF Password Remover for Mac. PDF Password Remover for Mac is a professional tool for Mac OS X users to remove pdf password including user password and owner password on Mac OS computers singly or in batches. For free trial of PDF Password Remover here, please click at here, then you can install PDF Password Remover for Mac OS X in your Mac OS X computer! System Requirement: Mac OS X: v 10.5, 10.6, 10.7, etc. After you open interface of PDF Password Remover in Mac OS X systems, you can click Add File(s) for adding pdf files. Then, you can select output folder by typing its related path in edit box Output Folder. Then, you can click on Start, and pdf files with owner password could be processed directly without any delay! The advanced utility can help you recover pdf password of owner directly and automatically. So you can notice successful information appearing on the right of processing table automatically. 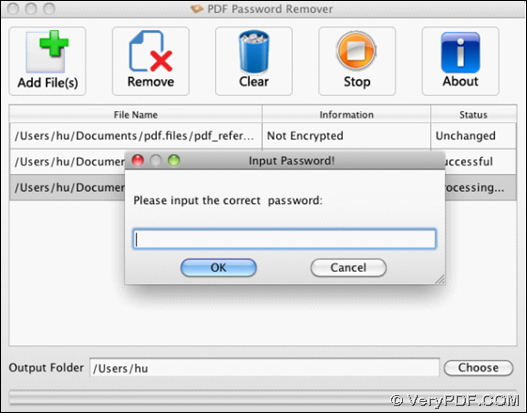 If your pdf files contain user password, this advanced application can offer you a pop-up dialog box to refer you to edit correct user password. After you click on OK there, PDF Password Remover can smoothly help you produce pdf files without user password into objective folder you set just now automatically and quickly! 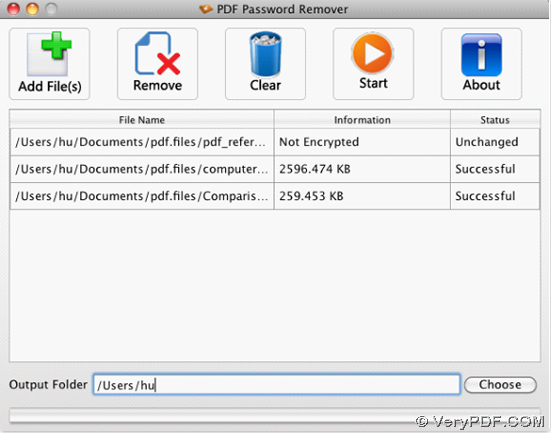 Is it very simple for you to operate PDF Password Remover in Mac OS X systems to recover pdf password? Please feel free to contact our support team as to any of your doubts on this utility or this article. For more products on Mac OS X of our company, welcome to visit related webpage of Mac OS X products here. This entry was posted in PDF Password Remover and tagged Mac OS X, owner password, pdf password, recover pdf password, user password. Bookmark the permalink.